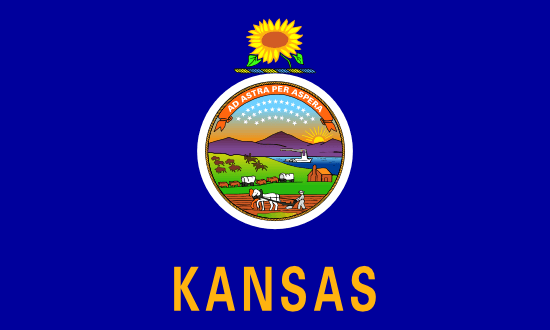 Kansas is an agricultural state in the Midwestern portion of America. The Sunflower State is one of the most productive farming areas in North America – generally speaking, conservative politics and an agricultural economy go hand in hand. Kansas is no different; the state’s strict conservative politics mean that Kansans don’t have easy access to legal sports betting. The nearest brick and mortar sports book is 1,200 miles to the state’s west in Las Vegas. Because the state’s penal code doesn’t outlaw the practice of placing sports bets on the Internet, people who live in Kansas have a much easier time betting on their favorite sports team by finding a legitimate online USA-friendly sportsbook. Please don’t make the mistake of thinking I am a lawyer or that I have experience in gambling law. I do not. I’m sharing information that I’ve learned over time while researching the subject of American online gambling. If you are actually concerned about getting in legal trouble while placing online sports bets in Kansas, I suggest you consult a lawyer with experience in both the state of Kansas and the subject area of gambling law. This information is intended to be educational. Only one professional sports team calls the state of Kansas home – Sporting Kansas City of Major League Soccer is headquartered in Kansas City, Kansas. Sporting KC won the 2000 Supporter’s Shield and the MLS Cup, and have reached the playoffs a total of eight times, including another MLS Cup win in 2013. FC Kansas City is a professional women’s soccer team founded in 2013 as part of the National Women’s Soccer League. They won the most-recent league championship, in 2014. Sports bettors who call Kansas home are likely to be fans of either college football or professional/college baseball. As football overtakes baseball as America’s national pastime, the population is somewhat split between the two. As you’ll see in the next section, when local universities are competitive in basketball, that sport’s popularity quickly overtakes what traditional hold baseball and football have on the region. The story of college sports in Kansas has traditionally been the story of the state’s two rivals, the University of Kansas and Kansas State University. A third school fielding some division 1 teams, the Wichita State Shockers, withdrew from football competition in the mid-1980s due to lack of interest, financial troubles, and several ongoing disputes with the NCAA over recruiting violations. The rivalry between Kansas and Kansas State is heightened by the fact that both schools compete in the Big 12 conference for all sports. The Kansas Jayhawks have won or shared 58 basketball conference championships since joining the conference in 1907, including five national championships. The Kansas State Wildcats have had some success in basketball, including several runs at the championship and eighteen outright conference championships, but nothing to compare to the dynasty at the University of Kansas. Though Kansas State has started to make a name for itself again in the world of basketball, and both teams are becoming more competitive in football, it’s tough to overlook the dynasty that is Kansas Jayhawks basketball. In case you’re wondering, Kansas has dominated K-State over the years in basketball, winning 188 out of the two schools’ 281 total meetings. In football, Kansas is also ahead, winning 64 of 112 meetings, Kansas State is on the rise, though, in the middle of a six-game rivalry winning streak that dates back to 2009. March Madness is the closest thing to a state sports holiday that exists in Kansas. Both the state’s big universities have been dominant in college basketball since the turn of the 20th century – while other schools in the Big 6 (later the Big 12) conference gained dominance in football, Kansas schools were building a rich tradition of basketball dominance. Such is the quality of basketball skills in the state, even tiny Wichita State has had big-time success at the D1 level, reaching the Final Four twice, most recently in 2013 on the back of an almost unheard-of undefeated regular season. Here are the most successful basketball programs in the state’s history based on appearances in the later stages of the tournament. Note that all three D1 teams in Kansas have a winning record during March Madness. In some cases, the state penal code of Kansas states that an offense of illegal gambling is a felony. That puts Kansas on the short-list of US states with pretty tough anti-gaming laws. The good news, though, is that no gamblers in Kansas are in danger of being tracked down by the state police and charged with a felony. There is no recent history that indicates the state wants to charge any individual with illegal gambling. Instead, Kansas, like most states, is more concerned with interrupting illegal gambling operations. The state penal code does not include a clause indicating that online gambling is illegal, like some other states in the Midwest, so it looks like sports bettors are safe to sign up with the book of their choice, provided they can find a funding method that works for American customers. Placing online sports bets appears to be totally safe while on Kansas soil. Kansans are sports-loving people – for the most part, these are hard-working agricultural types, the salt of the earth, “red-blooded Americans” with old-fashioned American attitudes toward sport. While the state is a hotbed of young basketball talent, pro sports have pretty much overlooked this part of the country, in part because of the state’s low population. Still, when March Madness rolls around, or when the nearby Kansas City Chiefs are playing well, the state’s loyal fan base will show their collective heads.